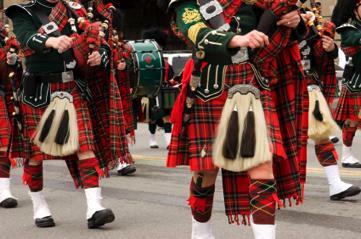 The authentic Scottish Kilt stands alone in terms of appearance and design. The typical authentic Kilt is made from twill woven worsted wool, and is available in different weights. The weights are given in ounces per yard ranging from light-weight 10-11 oz, the two most common weights 13 oz and 16 oz and the very heavy regimental worsted approximately 18-21 oz. Authentic Kilts are usually made without a hem, this ensures that it hangs correctly. The exact amount of fabric depends on the number of pleats and the size of the person wearing it (this is why its important to have it made to measure by a professional). The Kilt is worn fairly high on the waist and covers to the knee. 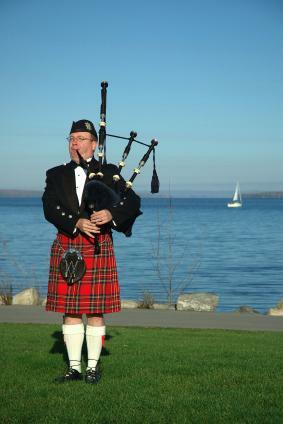 It is said that to gauge the correct length you should kneel down, and your kilt should not quite touch the floor. To put the garment on it is wrapped around the body, and then fastened with straps and buckles, the pleats to the back the aprons to the front. Arguably the most distinctive feature of the Scottish kilt is its tartan or sett, many of which are associated with clans or families. Many others however are available for districts, counties, countries and even corporations. There are also States, schools and universities that have their own tartans. And there are generic tartans designed for anybody to wear. For those of you living in the United States who wish more information on authentic Scottish kilts, I highly recommend visiting this Scottish/Irish Merchant who has all her kilts made in Scotland. The colours of the tartans are specified as in heraldry, although tartans are not heraldic, the exact shade will vary from one fabric mill to another as will one dye lot to another. They are woven in four standard colour variations that describe the overall tone. "Ancient" or "Old" which has a slightly faded look to resemble the vegetable dyes that were once used. "Modern" are bright colours created by modern alkaline dyeing methods. "Weathered" or " "Reproduction" simulate the look of older cloth weathered by the elements. The last variation is "Muted" which tends to earth tones. That means the approximately 5,000 tartans available have four possible colour variations each, resulting in almost 20,000 different tartans. All official tartans are registered with the Scottish register of tartans and although new tartans are added every year most registered tartans available today were created in the 19th century. As the Victorians began to romanticize the Scottish Highlands, they started registering tartans with clan names. Before that tartans had little or no connection with Scottish Clans. Therefor historically there is nothing to connect the clans to specific tartans, although today the connection is well established and clansmen wear their kilts with great pride.